National Debate Has Austin Stores Asking: Should We Stop Selling Confederate Flags? 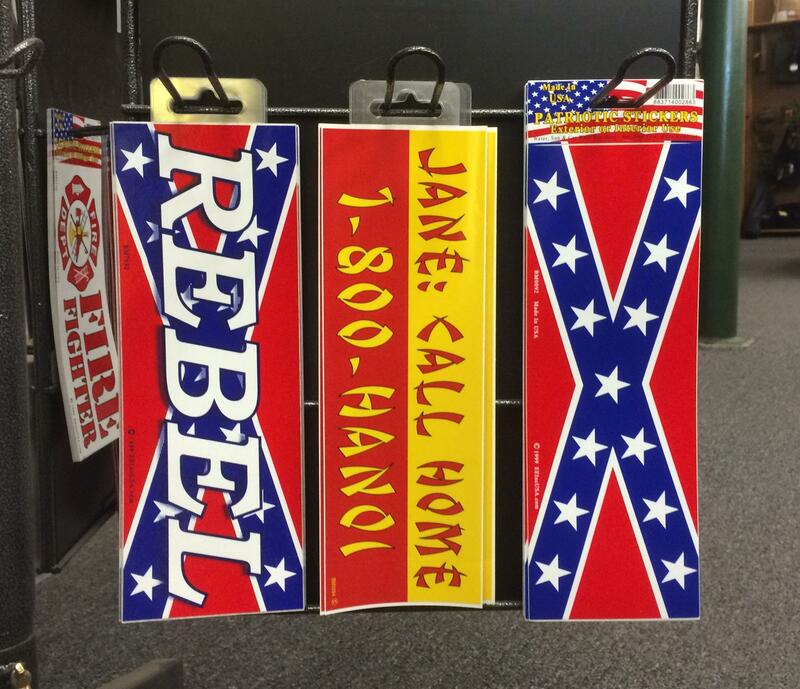 The owner of Banana Bay Tactical says they will continue to sell Confederate flag merchandise for now. After a tragic shooting at a historical black church in Charleston, South Carolina this month, there’s been a growing national conversation on whether or not to display or sell symbols of the Confederacy. National retailers Walmart, Amazon and eBay have all announced they will stop selling Confederate battle flag merchandise. Here in Austin, while some stores are also ending sales of Confederate flags and merchandise, others say they will continue to sell the products. "Took mine down, and they're out of here," says Ed Hall, owner of The Quonset Hut, a military surplus store just north of the University of Texas at Austin campus. Hall says that after the shooting and deaths in Charleston and seeing pictures of the shooter Dylann Roof posing with the Confederate battle flag, he changed his mind on selling the flag. A few miles up the road, however, another store is taking a different route when it comes to selling Confederate flags and merchandise. Confederate flag items for sale at Banana Bay Tactical in Central Austin include flags, pins, patches and these bumper stickers. Russ Krengel, who bought the store with his wife Jenny last year, says they have no plans to stop selling merchandise featuring Confederate symbols. "We're not into politics, we're into pleasing our customers," Krengel says, noting that many of those customers come from law enforcement. "We may consider removing the line in the future, but as it is right now, we're not making any big moves. It's really a non-issue in our eyes. If the rest of the world wants to blow up about it, that's fine, but none of our customers seem to care." Krengel says he bought Banana Bay because he thinks of it as an "iconic" small local Austin business that was in danger of closing, one of those places that represents "all these cool, independent-minded people that are willing to work hard and keep Austin interesting." The business has been around 25 years. Up until last year, when the Krengels took over Banana Bay Tactical, it used to sell pins and memorabilia from World War II, including Soviet and even Nazi items featuring swastikas. When the Krengels bought the store, they got rid of the Nazi paraphernalia and sold off much of their army surplus supply. Now the store focuses on military and tactical gear and clothing, which makes up most of their business. So far, Krengel says, they haven’t heard from any customers that are offended by the Confederate flags and merchandise. They also say they haven’t seen increased demand for them, either. With the debate over the Confederate flag at the forefront of national news, many people are aligning with one of two sides: the flag as a symbol of heritage versus one of hate. The conversation is happening in the wake of a South Carolina church shooting in which nine African-American men and women lost their lives. The shooter, identified as Dylann Roof, a 21-year-old white man, cites white supremacy groups as part of what motivated him for the killings. The shooter’s motives were posted in his online manifesto, where photographs showed him next to a car with Confederate flag license plates, and where he wrote he was attempting to incite a race war. He says he was truly awakened to his beliefs by the website of the Council of Conservative Citizens, a group led by Earl P. Holt of Longview, Texas, which traces its roots back to the desegregation era of the 1950s. From the Texas Tribune: A number of elected officials from Texas are parting ways with campaign donations from the white supremacist leader of a group tied to the recent massacre at a church in South Carolina. Earl Holt, a Longview man who heads the Missouri-based Council of Conservative Citizens, has given to dozens of Republican candidates and causes across the country, according to federal records. In Texas, he has spread around several thousand dollars over the past four years, state records show. Austin church and community members came together today to pray and grieve for the victims of the Charleston, South Carolina church massacre, in which nine people were killed Wednesday. The Metropolitan African Methodist Episcopal Church in Austin held a prayer service this afternoon to honor the victims. Minister Carolyn Turner Francis says she attended the ceremony to grieve with members of her community in a supportive, uplifting environment. The Texas Department of Motor Vehicles Board has approved a specialty license plate that reads “One State Under God." It has three Christian crosses on it. The DMV board voted 4-3 yesterday to approve the plate. The U.S. Supreme Court has backed Texas’ decision to forbid specialty license plates sporting an image of the Confederate flag, a ruling that could have national implications for how free speech protections apply to government services. In a 5-4 ruling released Thursday morning, the court ruled that messages on license plates constitute "government speech," as the state of Texas had maintained in court filings and oral arguments.